Highways England’s team of 1,300 specially trained gritter drivers based across the country are geared up for winter, ready to keep drivers moving. 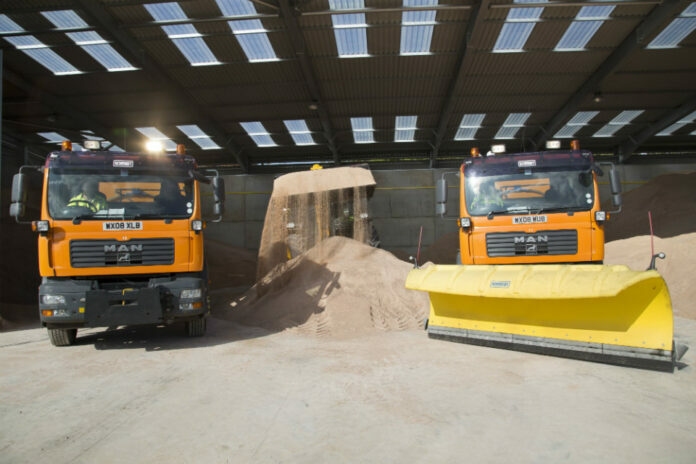 The company responsible for the country’s motorways and major A roads has over 500 salt spreading vehicles ready, around the clock, to help drivers get to their destinations safely. To monitor the weather Highways England uses 245 anemometers to check wind speeds and has over 260 weather stations at locations across its network. The overhead warning signs are also used to advise motorists of severe weather. Drivers should stick to the main roads where they can and only travel if necessary. Drivers are also encouraged to make sure they have a winter kit in their vehicle, including an ice scraper and de-icer, warm clothes and blankets and sunglasses to cope with the low winter sun. Drivers should slow down and avoid using exposed sections of road if possible. Lorries, caravans and motorbikes are at particular risk. Drivers should keep well back from the vehicle in front, gradually ease off the accelerator if the steering becomes unresponsive, and slow down if the rain and spray from vehicles makes it difficult to see and be seen. Drivers should switch on their fog lights and not use lights on full beam as the fog will reflect the light back. If drivers really cannot see, they should consider stopping until it is safe to continue. To keep informed about driving conditions along their journeys, drivers are advised to follow messages on the overhead signs and listen to radio updates. Previous articleThe pregnancy rate in under 18s has more than halved with experts noting that online relationships are replacing sexual. Men are more successful at passing their driving tests at Coventry test centre than women, according to the latest figures.